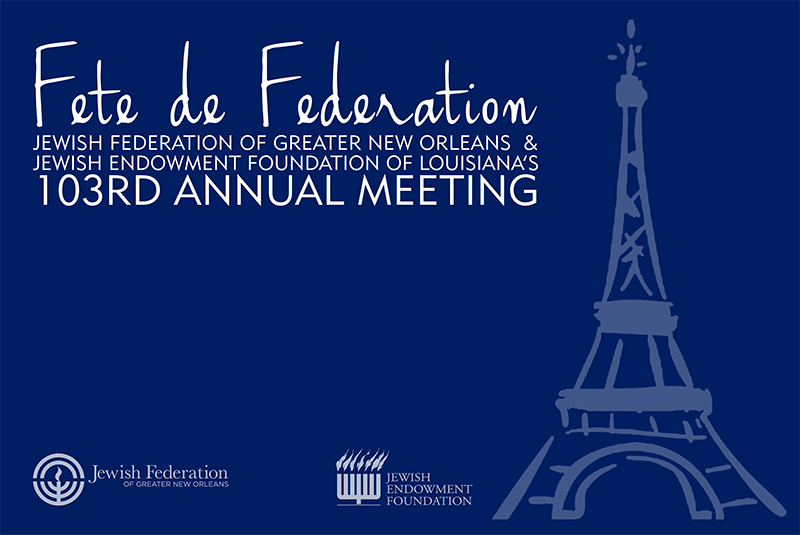 The Jewish Federation of Greater New Orleans and the Jewish Endowment Foundation of Louisiana will hold their 103rd annual meeting, “Fete de Federation,” on Sept. 22 at the Audubon Tea Room at 6 p.m. 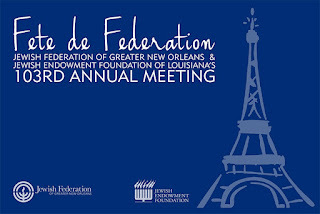 The Federation will celebrate the 2016 Annual Campaign, co-chaired by Lisa Heller and Dr. Juan Gershanik, and hold its annual election. JEF will present their slate, and bestow the 2016 JFNA Endowment Achievement Award on Anne Pake Lowenburg (article, page 15). Michele Gelman will receive the Herbert J. and Margot Garon Young Leadership Award. Steve Usdin and Cathy Bart will receive the Anne Goldsmith Hanaw and J. Jerome Hanaw Tikkun Olam Award for Campaign Excellence. Lis Kahn will be presented with the Roger Bissinger Memorial Award, and Michael Finkelstein will receive the Cohen-Jacobs Emerging Leader Award. The kosher dinner event will include dancing and music by Matt Lemmler’s New Orleans Jazz Revival Band. The event is open to all who have made a gift at any level to the 2016 Annual Campaign. Tickets are $50, $36 for those ages 21 to 35. Because the true cost for the event is more than the ticket price, those attending are asked to consider being an Angel at $150. The dinner is sponsored by Cox Communications, LCMC, Postlethwaite & Netterville, Ray Brandt Automotive Group, Sher Garner Cahill Richter Klein & Hilbert, LLC and Whitney Bank.